A beta reader of my WIP, The Daughters of August Winterbourne (Book 1) pointed out to me that my description of my main character Celia Winterbourne’s arrival in Oxford was…a little thin. Their carriage wended its way through Oxford’s maze of narrow cobblestoned streets. 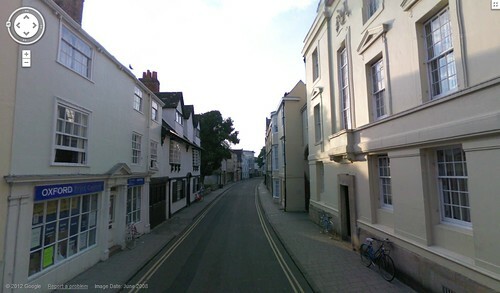 Celia gaped at the hallowed halls – or at least, the grey stone walls – of Trinity, Exeter, and Jesus Colleges as they passed. It was all just as she’d imagined it. The Academy lay just off Longwall Street, tucked behind Magdalen College. Like Oxford’s other colleges, a wall screened most of the campus from view, but as they paused in front of the main gate, Celia saw stone buildings that looked new and orderly compared to the older colleges. Yeah, okay. Probably not my strongest use of description ever. So what could I do to liven it up, short of a quick research trip to England? 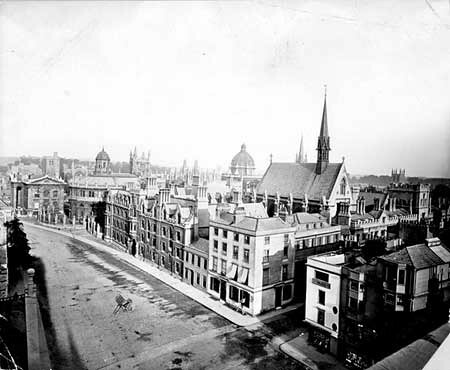 George Street to Broad Street to Holywell would be Celia’s approximate route to from the train station to the Academy of Science…as long as the train station is more-or-less in the same location now as it was in 1873. And according to this map of Oxford from 1870, it appears that it was. Yay! Which shows us that while the storefronts have changed a bit, most of the same buildings are in the same locations. 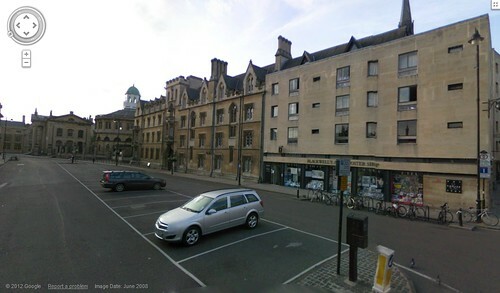 So a street view of modern Oxford is at least a good place to start. As their carriage wended its way through Oxford’s maze of cobblestoned streets, Celia pressed her nose to the window, eager to get a glimpse of her new home. She saw buildings crammed cheek-by-jowl along the very edges of the streets, honey-colored stone alternating with red brick and whitewashed plaster. They towered three, four, or even five stories high over streets that were sometimes barely wide enough for two carriages to pass. In contrast, the aptly-named Broad Street teemed with both carriage and foot traffic, the latter mostly male, students on their way to various colleges around the town. 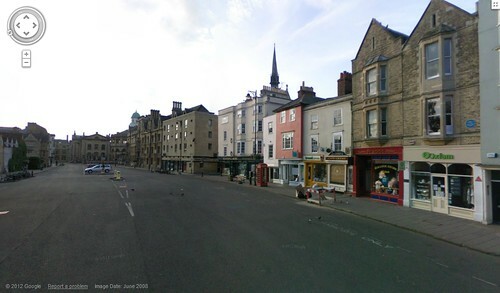 Mrs. Chattisworth pointed out Balliol and New College as they passed. To Celia’s disappointment, their buildings didn’t look all that different from the shops, inns, and houses that surrounded them. Just older. She resolved to go back for a better look later. 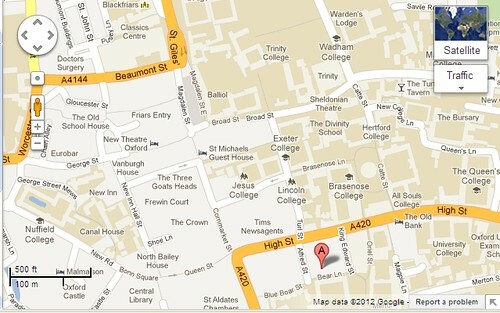 The Academy lay just off Longwall Street, tucked behind Magdalen College. The wall for which the street was named screened most of the buildings from view, but as they paused in front of the main gate, Celia saw stone structures that echoed the medieval style of the older colleges, save that they looked newer, cleaner and crisper. Which I think is something of an improvement. Now if I can just remember to include more extensive descriptions throughout my work! This entry was posted in Writing and tagged craft, research. Bookmark the permalink.